Some prospective renters are very careful and thorough in choosing the place they will stay at on holiday. I was still very surprised on the 2 occasions a potential client asked if we had anybody living in the building right near us … Or how far away were the neighbours as they looked pretty close on Gooole Earth ( the answer is no, they are 200 m away). Google Earth ?? I would never have thought of checking a location this way but it is a great idea as you can check the accuracies of any rental claims. We are in a very peaceful and green location indeed . Our only neighbour is 200m away. I always thought it was more like 600 as Martino looks like a big ant when seen from the front garden. 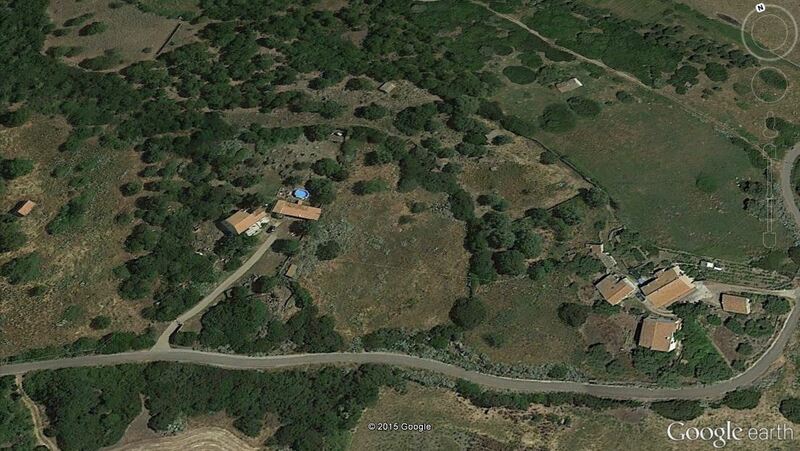 There is another building on the property (highlighted in red) but nodody lives there but the odd lizard ! So here is the story of a eco-rebuild-whilst-keeping-all-the-authentic-features-in-project. Malc & I are very fond of the TV program ‘Grand Designs’. When we first started doing up the stazzu, it did cross my mind to call the channel to see if they wanted to follow our rebuild. Aren’t I glad I never did it !! More than 3 years down the line and we are finishing it still. Of course, there was bureaucratic hold ups and delays. And the fact we can only work for some part of the off season …. Did I mention the fact Malc is an early bird and I am anything but ? Anyway, we are plodding on and this lovely 19th century stone country house shall be open for rental in the spring 2017 at the very latest. And we have always intended to rent it as an add on annexe to the main house rather than 2 separate rentals. This means the holiday location retains its privacy but is available for couples and smaller groups ; or larger groups of friends, large family etc. Privacy is what Villa Nuraghe is all about ! 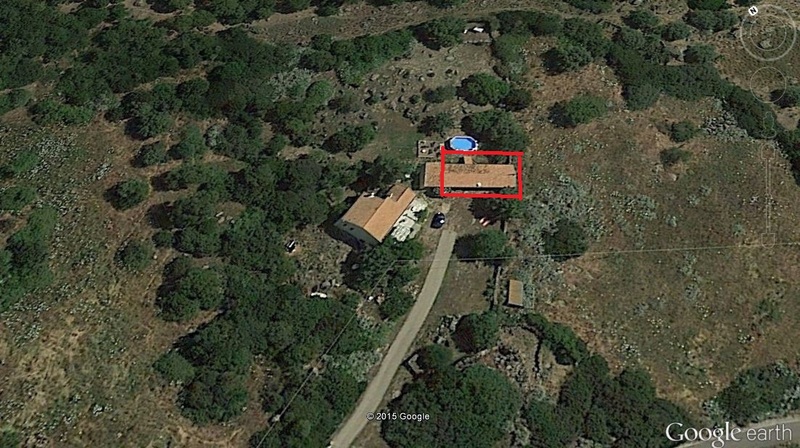 When we first looked at the stazzu ( “Stazzu” is the sardinian name of their typical country house. They kind of look like a Devon longhouse or farm), it had been unhabited for a good 40 years plus and was used as food and general surplus storage. The owner , now is her mid sixties was born there as were her parents. There were a total of 4 siblings and the parents living in a 3 room house, a fairly common occurrence back then. There was no mains water and no mains electrics. It was the woman’s job to fetch the water daily from the local fountain (that doubled up as the clothes washing/ gathering place). The mains electricity only arrived in the hamlet in the early 70’s as did tarmacked roads. I kid you not ! Lighting was by candle lights, oil or gas powered lamp until then. Cooking was mostly done on an open fire indoors (or using a charcoal burner in the rudimentary kitchen) or the traditional oven. With the propagation of gas and electric cookers, washing machines and mains water finally arriving here , women were un-slaved from some of the most time consuming chores. So here is a series of before / during / after pictures of our stazzu restoration. This is still a work in progress so I will keep adding pictures and details until it is completed. more cracks in the wall ..
Building up that wall straight to receive a shower. Still to do before opening for rental: tile 2 rooms, put the solar panel and 2 ensuite bathrooms in. As for the outside, we need to sandblast the stones and pointing. Quick to type those jobs up , way longer to achieve ! An English green architect and his artist wife moved into the village recently and we showed them around . They told us about their belief of “integrity in design and honesty in the rebuild”. According to them, an old building should not be done up as new, with straight walls etc. I was quite upset that day as despite 2 thick coats of render and countless hours work to make the roof line good and quasi invisible, you could still see where the edges were between the old building and the current raised room and roof. They both told me they preferred it that way as you could see the changes the building had undergone and it was in effect better having textured / non straight walls as all the stazzu was like that anyway …. So I did let it be. And after a coat of paint, it was looking great in all its authentic glory ! Come back to this website regularly as more will added as the renovation progresses! This festa is one of the most important for this rural community. San Isodoro is indeed the patron saint of farmers and shepards. Many of them do turn up for the procession and the following mass afterwards. The display of beautifully decorated tractors and horse riders in traditional costumes is well worth seeing if you happen to be in Sardinia that second week end of September. Similar processions take place all over the island on this special day. Here is a serie of pictures. Enjoy !! Our first newly weds !! We were very flattered to have a lovely couple from Belgium choosing specifically our villa for their wedding and first part of their honeymoon. The wedding ceremony was held in the grounds underneath Castelsardo castle. Bert and Kelly very kindly invited us and it was beautiful. Though we did not understand Flemish, we could feel the emotion and strength of their commitment. This was followed by a delicious meal in an agriturismo and winery near Sorso. Knowing how much Bert and Kelly meticulously planned every detail of their wedding, it was an honour to hear them say it was the best place they ever stayed at . Happy New Year to you all. May you have fun, travel loads and discover many great things about the world around you and yourselves !! This post has been 5 months in the offing as we did 2 local via ferratas this summer. I suggested to Malc that he prepares the post for a change as he was a very keen free climber back in the 80s. This obviously did not happen in time 😉 and after all, the impressions of the VF might as well come from a semi beginner like me. So here are my memories and impressions of those climbs . Absolutely beautiful and panoramic scenery from the cliff face as you tower over the clear blue sea of the Porto Conte bay. From the rock face, the big tourist boats looked like lego ones, lol ! Make sure to start the VF by 10am at the very latest as it is positively cooking on the cliff face which is in the full sun by 2pm. We left Perfugas about 8am and arrived at the site at 9am which was perfect. There is free parking near the start. The approach is longer than stated on the website, I would say about 30 mns minimum, all uphill. There is a large cave at the top which can be clearly seen on the approach and is a good place, with stunning views, to enjoy a cool drink and sort out your gear before you start the climb. view from the parking spot onto Porto Conte bay. Quite the touristic spot that littlle island. The1st section is a ledge and is more of a stroll really, with some protection. At the end of it, you have the 22 metres long vertical section and short traverse . This can feel a little exposed, especially in a keen breeze from the sea. So let me be clear, if you suffer from vertigo, don’t do it !! And if you have poor arms muscles like i turned out to have, this may be a challenge. I attacked it fairly quickly as those metal steps constituting the vertical are on a slight overhang and I could feel my arms getting tired by having to support my own body weight. I should have listened to Malc’s advice about using the extra sling and carabina to allow me to clip on to the metal rung and hang in my harness whenever I felt like a rest. The island opposite the VF. After that, the second ledge starts. It is very narrow in places and there are some interesting moments to be had, especially if you are 5,2 ft and need to seriously stretch at times or are 6,2 in which case you will have “extra fun” in some sections too. It is not difficult but some sections have an overhang which means leaning out on the wire whilst placing feet carefully on the rocks. Again this can feel quite exposed, but the beauty of the rock and the sea are fully realised on this section. There are plenty of places to stop, have a rest and enjoy the panorama. This VF can be done clockwise or counter clock wise. However, I would not like to have to cross over somebody on some narrower ledges so I would recommend to keep to the usual climbing direction. You can freely park near the church at the top of the village. The approach to the site takes about 30 mns. You will notice many bolted climbs routes along the way. The other interest thing is the 20 metre long Tibetan bridge , not too long but nice sensations. As always, great views and plenty of resting places and long strolls between the climbs. Lizzards are the animals you see the most at the villa … and everywhere else in Sardinia. I think it is high time these laid back creatures get a slideshow of their own !